Big ad revenue-sharing payments have been weighing on Google's margins. But its mobile and video ad sales have been booming. In February, Alphabet's (GOOGL - Get Report) shares sold off after the company beat Q4 revenue estimates but missed EPS estimates due to steep revenue-sharing payments and slight margin pressure. Can the Google parent satisfy investors this time around? With Alphabet's Class C shares down about 10% from a January peak of $1,186, expectations aren't especially high ahead of the company's Q1 report, which arrives after Monday's close. TheStreet will be hosting a live blog covering Alphabet's first-quarter earnings at 4 p.m. ET. Please check our home page for more details. Excluding traffic acquisitions costs (TAC), or ad revenue-sharing payments to partners, the FactSet analyst consensus is for revenue of $24.26 billion (up 21% annually) and GAAP EPS of $9.28 (up 20%). In Q4, TAC accounted for 24% of Google's ad revenue, up from 22% a year earlier. TAC's share of ad revenue on Google's own sites and apps grew to 12% from 10%, and its revenue share for third-party sites and apps grew to 74% from 70%. Google blamed ongoing shifts towards mobile ad sales and programmatic (software-automated) ad buys for its TAC pressures. A revamped deal with Apple (AAPL - Get Report) under which Google is once more the search engine for iOS's core search features (in addition to remaining the default engine for the Safari browser) appears to be taking a toll. TAC trends drive home the strategic importance of Android, as well as Google's Search and Chrome iOS apps, in protecting its massive search ad profits. In addition to TAC, the impact of rising hardware sales and capital spending on Google's margins will get close attention. Pixel phone sales contributed to a 34% Q4 increase in Google's "other cost of revenue," which covers the direct cost of supporting Google's products and services. So did higher depreciation expenses related to past capital investments: Google's purchases of property and equipment rose 29% last year to $13.2 billion. Jim Cramer and the AAP team hold positions in Alphabet and Apple for their Action Alerts PLUS Charitable Trust Portfolio. Want to be alerted before Cramer buys or sells GOOGL or AAPL? Learn more now. 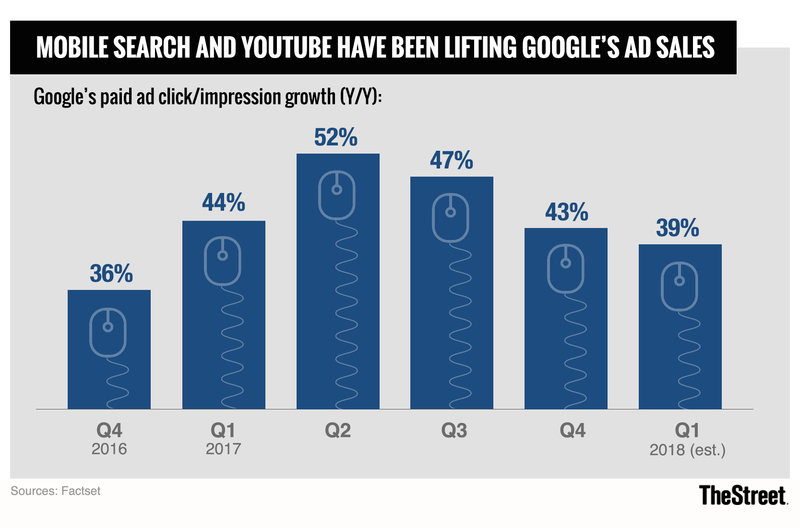 Thanks to burgeoning mobile search and YouTube ad sales, Google's total paid clicks and impressions have been growing rapidly. They rose 43% annually in Q4, easily offsetting a 14% drop in average ad price (cost per click). Analysts expect paid click growth to slow slightly in Q1, but remain at high levels. Possibly weighing on Q1 sales: The fact that Google has now passed the one-year anniversary of major 2016 changes that gave mobile search ads more screen real estate and advertisers more flexibility in terms of how they bid for ads shown on a particular type of device. At the same time, Google Search remains a vital and unmatched marketing channel for big advertisers in a number of industries. And the company's investments in areas such as enhanced targeting, local ad solutions and AI-driven "smart bidding" for ad campaigns have been paying off. Merkle, an online ad agency that caters heavily to retailers, reports its clients' Google search ad spend rose 20% annually in Q1, a slight decline from Q4's 23% growth. The firm saw just a 4% increase in spending on Google text ads, but a 40% spending increase for Google Shopping ads. With Google having recently merged its Nest smart home hardware unit with the core Google hardware team, Nest will now be a part of Alphabet's Google reporting segment, rather than its money-losing "Other Bets" segment. In earnings reports, Nest's revenue will be added to the "Google Other Revenues" reporting line, which covers all of Google's non-ad businesses (hardware, cloud apps/services, YouTube Red subscriptions, etc.). Thanks to Pixel sales, Google Play transaction growth and the Google Cloud Platform's (GCP) momentum, Google Other revenue has been growing strongly: It rose 38% in Q4 to $4.69 billion. If growth decelerates meaningfully in Q1, it could be a sign that Nest's growth is much slower than that of the existing Google Other businesses. Separately, taking Nest out of Other Bets will provide a clearer picture both of how much revenue the "moonshot" businesses still within Other Bets are producing, and how much red ink they're generating. With Nest included, Other Bets, which covers businesses such as Google Fiber, Waymo and the Verily life sciences unit, posted a $3.4 billion operating loss last year on revenue of just $1.2 billion.